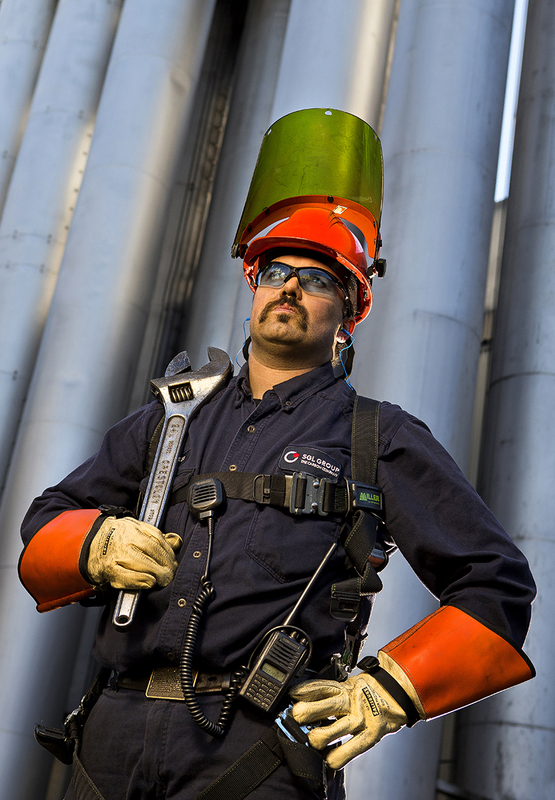 Advanced lighting techniques helped capture and illustrate the strength of this industrial worker posing outside the manufacturing facility. Capturing the confidence, strength and certainty of employees on the job is a powerful way to reinforce the corporate brand and add dimension to the company story. In the background of this manufacturing plant worker, we wanted to give just a hint of his surroundings, the graphic lines of which give visual interest and depth. We created the photo using two Speedlight units, the first positioned high and to the left of the worker. The second Speedlight - zoomed to 85mm -- was located behind the worker to produce a backlight that helped him pop out from his background. We placed a strobe high to avoid causing distracting bursts on the reflective surfaces of his glasses and helmet.